without the risk or danger of completing the gymnastic skill"
"when can i go in?" and they wonder those dreams again. repeating words "confidence is key"
"my daughter is a level 4, learning new skills"
a married lady and here we are now"
in every young mothers heart. and she wants to show you!" the lone little bird obediently following. turns to the window glass, seeking also. she gives me a huge grin. and so it is to be. 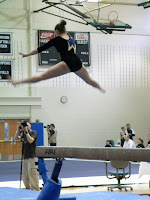 Thank you Annabel for letting me be your gymnastic mom all those years. Oh Darn it you made me cry.This is so beautifully written. I could feel what everyone of us Mothers have felt, the joy of watching our children succeed and the path that we have traveled with them every baby step one after one. We watched them fall watched them pick themselves up and the steps getting longer year after year. We watched them turn into remarkable strong woman or men but I only have daughters but it is the same for women with sons I am sure. My chest is hurting as my heart swells and old memories emerge and linger. Darn it you made me cry. Darn it you made me cry I hope it stops soon. Oh I had to come back and read this one more time it is a beautifully written piece and I just had to relive your day. Cries here too . . . beautifully written and filled me with mother daughter memories . . . loved this . . .
Brought tears to my eyes too! You tell us in your wonderful way what it's like to be a Mom watching their little bird (in whatever they are doing)and the emotions they feel. Wonderful! Little birds. So well written I could see it. You must be very proud of your daughter. so sweet. the baby birds. splat. lovely! This is so well written...I can just feel the emotion you and those other moms are/were feeling, watching their little birds learning to fly! "...she folded little bodies like they were colorful towels..."
love that image so much. My daughter's name is Annabelle, you made my heart ache. Simply....beautiful. Thank you for sharing your wonderful gift. It's as though the most beautiful words came out of your heart, to be strung together by love, and to then be shared with all of us. I have missed some of your posts because I've been ill, but how glad I am that this is the one I got to read. I've always liked the way you write, but this is so special, it touches my heart, my heart that didn't raise a child, my heart that did so poorly in gymnastics, why ~ because the words came from your heart to show your love for your daughter. And because you are blessed with a great skill as a wordcrafter and poet. The sweet rewards of children who fly from your nest and land with confidence. Yes. Loved this one especially. Tears here also. You are an impressive writer, and an amazing person! Sweet. How proud you are to watch the fruits of all the labors.... both yours and your daughters. All the years of driving to and from the gym....I imagine it was thus because I was a skating mother and I recall all the early hours and long days. It's nice to remember. You convey the scene so beautifully with your eloquent writing. Lovely. I dont comment very often... but this is so beautiful. I recognise it all.....our little gymnast is 32 now, a mother of 2, and she still talks of those days so fondly. A lovely piece of writing, and I too, have tears in my eyes. J. What a wonderful experience and your words define your feelings so well. I am in awe of these girls that can challenge their bodies to do such amazing things.